The eastern Deir az-Zor provincial town of Abu Kamal (more accurately in Arabic, 'Albukamal')- on the border with Iraq- recently came to headlines with reports of clashes between the Islamic State of Iraq and ash-Sham (ISIS) and other rebels including Jabhat al-Nusra (JN), resulting in dozens killed. What is the story behind this incident? Maps put out in mainstream media outlets (e.g. the BBC) have frequently color-coded Abu Kamal as an ISIS stronghold. As demonstrated previously, this characterization is highly inaccurate. One need not repeat at length what has already been written, but to recap for convenience: the town itself is controlled by six different factions. One of these- Kata'ib Junud al-Haq- is the local JN affiliate, and arguably the most influential in the town and wider area, having exclusive control of the Shari'a Committee. Briefly in late spring and summer last year, Kata'ib Junud al-Haq was part of ISIS, re-defecting to JN following Aymenn al-Zawahiri's call for ISIS to be dissolved. 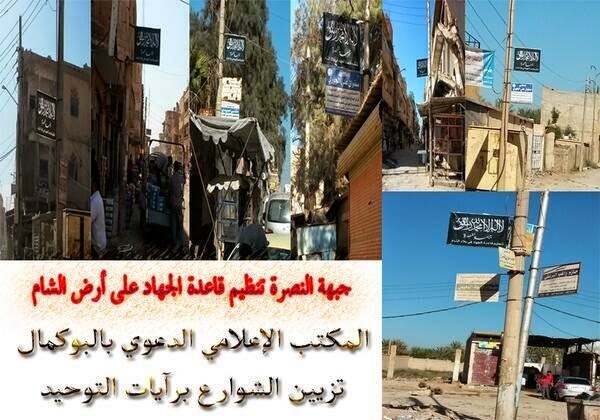 JN signposts in various parts of Abu Kamal, illustrating the group's influence: "The da'wah media office in Abu Kamal: decoration of the streets with banners of Tawhid." The other five are Katiba Bayariq al-Sunna, Liwa al-Qadisiya al-Islamiya , Liwa al-Mujahid Omar al-Mukhtar, Kata'ib Allahu Akbar and Liwa Allahu Akbar. Of these groups, the first two are independent but closely aligned ideologically with JN, the third is an independent grouping that professes no real political program beyond bringing an end to the Assad regime, the fourth is an affiliate of the Authenticity and Development Front (ADF: an Islamist coalition professing influence from Saudi religious thought) and the fifth is aligned with the SMC. "Up to now Ahrar ash-Sham remains the most organized Syrian Islamic faction and the least sinful, maintaining a good reputation among the sons of the Syrian people from the beginning of the revolution…with loyalty and purity till now in the shadow of chaos it has remained, excelling by far factions on the ground." Jointly, the six groupings have maintained a "security battalion" responsible for maintaining order in the town, and are represented on the local governing council. In September last year, JN clashed with Liwa Allahu Akbar, which was then led by one Saddam al-Jamal, accused by JN of being a criminal. Later, Saddam was apparently kidnapped by ISIS, which maintained an underground presence in the wider area, and broadcast a video of his apparent defection. At the time, it seemed that Saddam's supposed confession was made under duress and therefore not genuine and of little importance. After all, in the immediate aftermath of Saddam's disappearance, nothing had changed on the ground, and he was not exactly missed by members of the other factions. 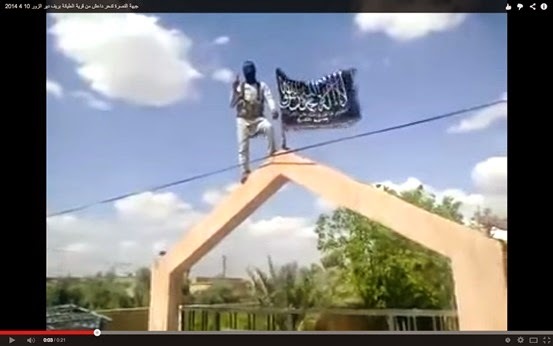 Further, at least two of the town's factions- namely, the local JN and Liwa al-Qadisiya al-Islamiya- had some sympathy for ISIS, with the local leaders aiding ISIS across the border in Iraq. However, it turns out that regardless of the nature of Saddam's initial testimony, subsequent rumors that he became ISIS' local amir in the Abu Kamal area were correct. This development, together with the wider infighting across Syria between ISIS and other factions that broke out in January, proved important in the creation of tensions between ISIS and other groups in the area, culminating in the heavy fighting we have just seen. 1. Our rejection of this fitna and Liwa al-Mujahid Omar al-Mukhtar's return to independence not affiliated with any side. 3. Our affirmation and support for the so-called 'Ummah Initiative' [Sheikh Muheisseni's attempt to stop infighting] and any initiative aiming to stop the fighting and apply God's law between those disputing among themselves." In the Abu Kamal countryside, where more factions exist beyond the six in the town, a certain group called "Jund ash-Sham" (not to be confused with the group formerly based at Krek des Chevaliers that was founded by Lebanese muhajireen) declared its support for ISIS. 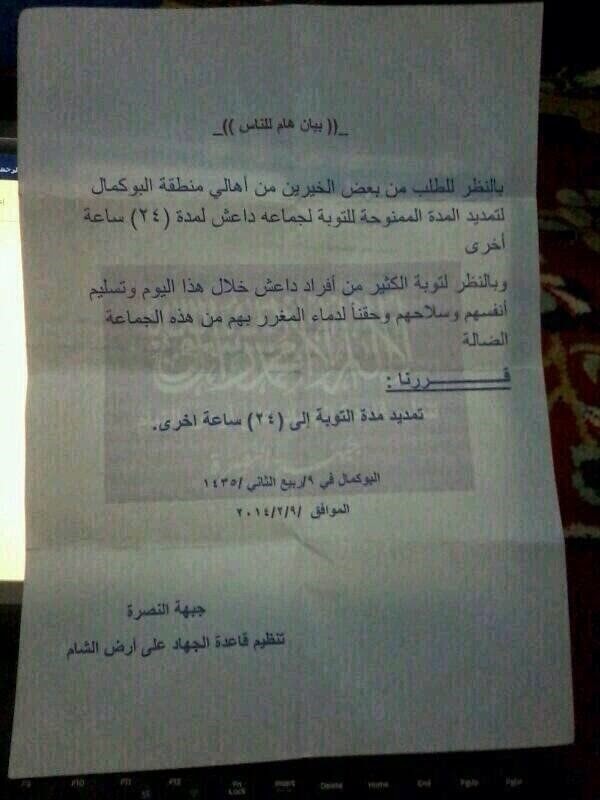 Local JN statement on 9 February extending repentance deadline for 24 hours to 'da3esh' (derogatory acronym for ISIS). "The group was on its way to carry out a military mission as part of the missions of the 'Battle of Bay'ah', and on the path there was an ambush for them set by a gang from the so-called 'Islamic State'- da3esh- under the leadership of the criminal 'Saddam al-Rakhaytah' [Saddam al-Jamal] so they surrounded the group of fighters and after their surrender, they were bound and then killed in cold blood with shots to the head and marks on their pure bodies. This account came from an eyewitness with the Shari'a Committee in Abu Kamal. The criminal Saddam al-Rakhaytah spared him to send a message to the mujahideen in Deir az-Zor: that the da3esh gang will kill every mujahid who comes into their hands and so the ADF has undertaken to call out its mujahideen in Deir az-Zor and fund this criminal and those with him, for they are wanted by all brigades of the ADF in the expanses of Syrian lands so that they can face judgment and be punished with just retaliation for the crimes they have committed against the Syrian people." The four Kata'ib Allahu Akbar fighters killed by ISIS in March. The local JN branch released a statement on the same day, condemning ISIS for the same ambush but also accusing Saddam al-Jamal and his followers of two other actions: first, "placing a car bomb to blow it up in the middle of the public square from the path of its followers (Ans al-Hadid and Yusuf al-Juburi from al-Baghuz)" and "placing IEDs among civilian families in the middle of Abu Kamal without regard for the safety of families and civilians from women and children (IED on the military checkpoint- IED on the house of Ya'ud Layith Sharaqat- IED on the house of Hamadi al-Alaiwi)." "Now, now the fight has come": JN's renewed offensive on ISIS in eastern Syria at the end of March. As it so happens, the intense fighting in al-Markadah has led to the killing of at least two JN fighters from Abu Kamal: Zayd al-Omar and Omar al-Shaman, whose corpses are shown here. 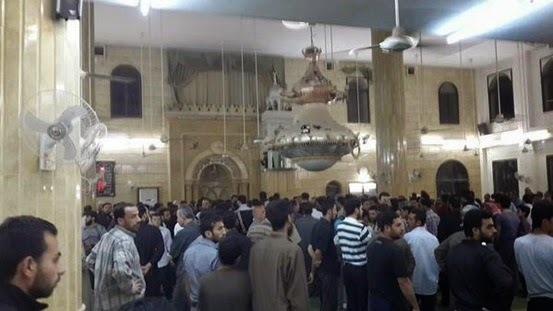 This led to an emotional funeral eulogy from the Shari'a judge in Abu Kamal known by the name of Abu al-Layth (real name: Muhammad Majul al-Rawi, who, despite his surname suggesting ultimately Iraqi origins, was a native of Abu Kamal). In the eulogy, he denounces ISIS as the "gangs of Rafdan" (referencing Aamer al-Rafdan: ISIS' amir in the Deir az-Zor province but to whom he ascribes control over Hasakah; also renowed for criminality like Saddam al-Jamal; his house was blown up in February by rebels) and "gang of Saddam al-Rakhaytah." He then accuses ISIS of killing youths, entering Muslims' homes by force, abducting women from their homes in the middle of night: "You know, oh people, what Saddam al-Rakhaytah's gang has done." He further denounces those who would suggest that the fight against ISIS is a case of "fitna," which implies equal wrongdoing on both sides. 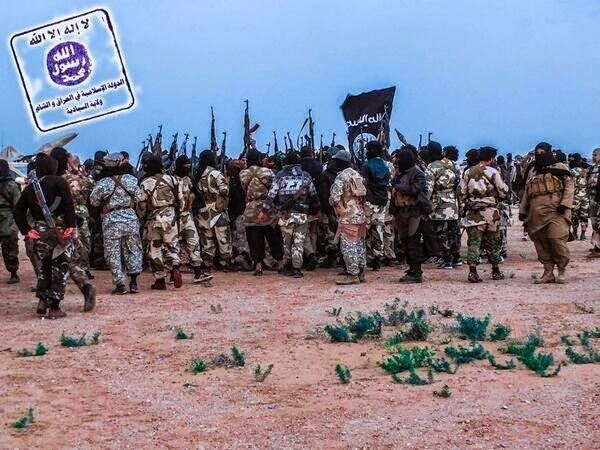 In the circumstances of a growing ISIS presence in the desert expanses, a clandestine local ISIS insurgency, and a renewed offensive on al-Markadah by ISIS' rivals, a new ISIS offensive on eastern Deir az-Zor province comes as no surprise. The starting point was overnight ISIS movement on 9-10 April primarily focused on Abu Kamal. By how many routes ISIS moved on the town is a matter of dispute. Some accounts give an attack from two fronts: across the Iraq border (as happened last time in February) and from the southwest desert areas (i.e. 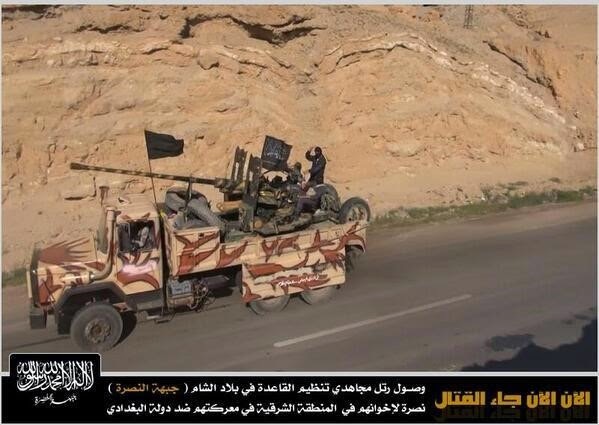 ISIS' Wilayat al-Badiya). 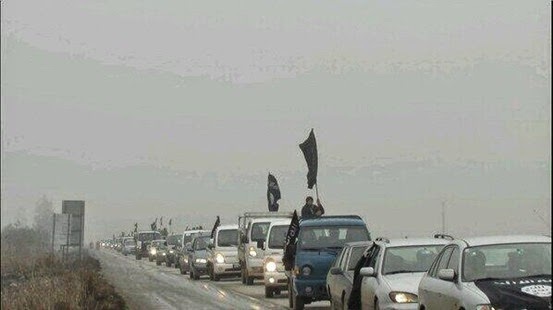 While an attack on Abu Kamal using manpower from Iraq would be logical in trying to connect Anbar and Deir az-Zor provinces in ISIS' hopes of building a continuum of territory over the borders (which they have already done so to an extent with Ninawa and Hasakah provinces), Jabhat al-Nusra's local spokesman in an interview denied that ISIS came over from the Iraqi border, saying instead that they "departed from Raqqa and came from the Abu Kamal desert" (i.e. to the southwest). 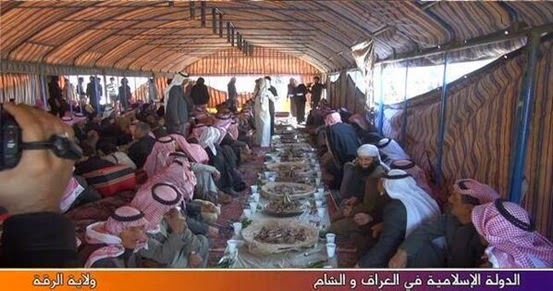 The first ISIS contingents to arrive in Abu Kamal early on 10 April consisted of native Syrian members who moved in on the cultural center in the town, which has been used by Liwa al-Qadisiya al-Islamiya as a base. Apparently the ISIS fighters presented themselves on friendly terms to the rebels in the cultural center but then quickly turned their weapons on the rebels, overrunning the center. ISIS' main forces then arrived in the town and overran multiple sites, including the Shari'a Committee's building, the Baghuz bridge, the "industrial area," and the grain silos. 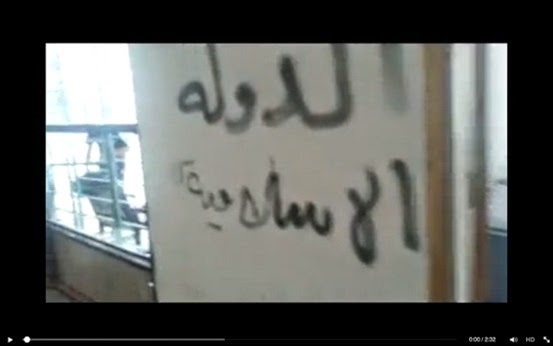 ISIS graffiti- "Islamic State"- inside the JN Shari'a Committee building in Abu Kamal. Remnant of the assault on 10 April. The other rebel contingents in the town quickly mobilized in response sparking intense clashes before midday. By mid to late afternoon local time, much of the areas taken by ISIS had been recaptured by JN and the other local factions, confining ISIS control to a local hospital- the A'isha hospital- the industrial area and the grain silos. The A'isha hospital soon fell into rebel hands, but Saddam al-Jamal and his associates, who were allegedly inside the hospital, escaped capture and joined the remaining ISIS contingents in the industrial area and grain silos. By nightfall, ISIS had been driven out from the town and was then expelled from the surrounding countryside into the desert areas at the hands of local battalions (e.g. Kata'ib Ahfad A'isha- whose leader Abu Ibrahim was killed in the fighting- and Katiba la Ghalib illa Allah), who, like the town's local factions, drew on tribal support and had sent in some fighters to assist the rebels inside the urban area. The expulsion of ISIS by nightfall was celebrated with victory parades that can be observed here. The fighting came at a heavy price. A complete list of those slain on the rebel side can be foundhere, but one of the most notable losses was Abu al-Layth for JN. 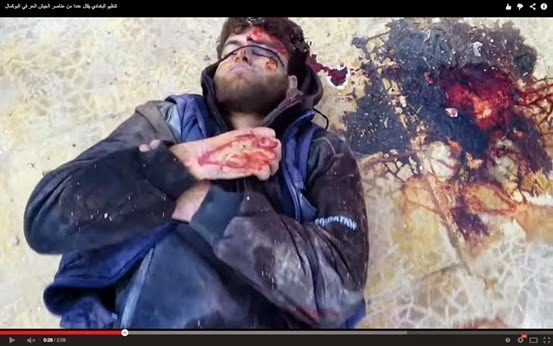 The corpse of Abu Ibrahim, the leader of Kata'ib Ahfad A'isha slain in clashes with ISIS. 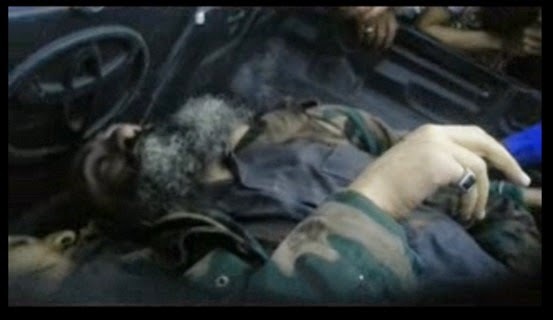 Saraqa Khalid al-'Aran (Abu Lu'ay): a Liwa al-Mujahid Omar al-Mukhtar fighter who was killed in the clashes with ISIS. A full list of the brigade's dead- totaling 20 people- can be found here. The battalion hails them as martyrs killed fighting "the Nusayri dogs of da3esh." Note that the instances of shared surnames appear to show the brigade, like other factions in the town, is based on local families. Elsewhere in eastern Deir az-Zor province, the three main localities ISIS tried to enter on 10 April were Kabajeb, al-Quria and Taiana. 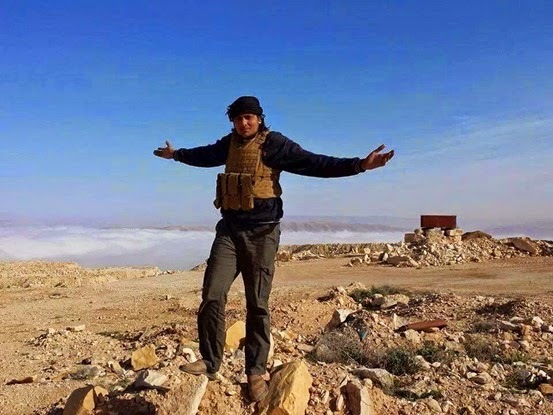 In Taiana, ISIS were expelled during the afternoon by JN, and ISIS' disappearance from the locality was confirmed on the following day in an interview with a contact from the area. JN flag in Taiana amid celebration at the expulsion of ISIS from the town. 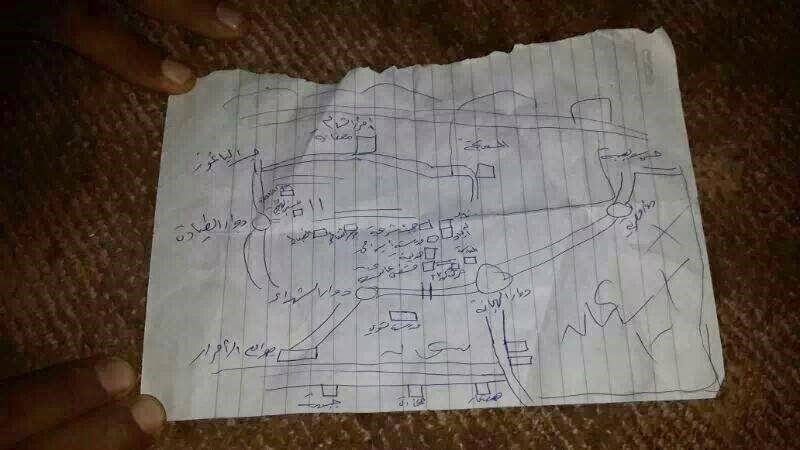 In al-Quria, the situation was more complicated as an apparent local agreement was reached between JN and ISIS that neither side should hold up its banner in the town. Here is a video of a reception given to a Tunisian fighter from ISIS, expressing his intentions to establish God's law in the land. In another video, an ISIS fighter in al-Quria speaks of the "much ignorance" and shirk [polytheism] in the town. ISIS' entry into the town was supposedly facilitated by a local battalion called Liwa al-Qa'qa', which was accused by JN of being an affiliate of ISIS. However, Liwa al-Qa'qa"s leadership denied these claims. The following day saw a demonstration in al-Quriaagainst ISIS calling for the group's expulsion from the town. Finally, in Kabajeb, ISIS' assault was ultimately unsuccessful, with a number slaughtered by the Islamic Front and JN. The fighting in Abu Kamal marks the first major ISIS offensive on rebel-held areas since the infighting broke out to have been repulsed. One factor undoubtedly significant here in the failure of the ISIS offensive (dubbed "the conquest of Abu Kamal" in ISIS social media) is the lack of local support for ISIS, particularly in light of ISIS' leaders in the area being associated with criminality. The situation should perhaps be contrasted with eastern Aleppo, Raqqa and Hasakah provinces, where ISIS has been able to co-opt local tribal support. The phenomenon cannot be dismissed as mere ISIS propaganda. ISIS' lack of local support in the Abu Kamal area and nearby localities notwithstanding, the rebel side clearly sustained much heavier losses, and ISIS' free rein in the Badiya areas in particular means that there is still a considerable chance of a renewed ISIS incursion or offensive in the near future. In short, we may well call these recent clashes a Pyrrhic victory for the rebels, and the ability to withstand another ISIS attack (backed by superior financial resources and weaponry) must be somewhat in doubt.